Companies in the United States have been putting an emphasis on building culture at the workplace due in large part to millennials, the largest generation in the workforce. Millennials demand more than just a paycheck, they want to experience a sense of community. Company culture is so important to millennials that they are even willing to take a $7,600 pay cut to work in an environment where culture is a priority. But, just because millennials make up the largest part of the workforce and are exerting their influence at this time doesn’t mean workers in other generations don’t care about company culture. While there are significant differences between age groups in the workforce, the majority of workers, regardless of demographic, want to be engaged and work where the culture aligns with their values. One way to build or improve company culture is by changing the aesthetics of the working environment with experiential design graphics (EDG). 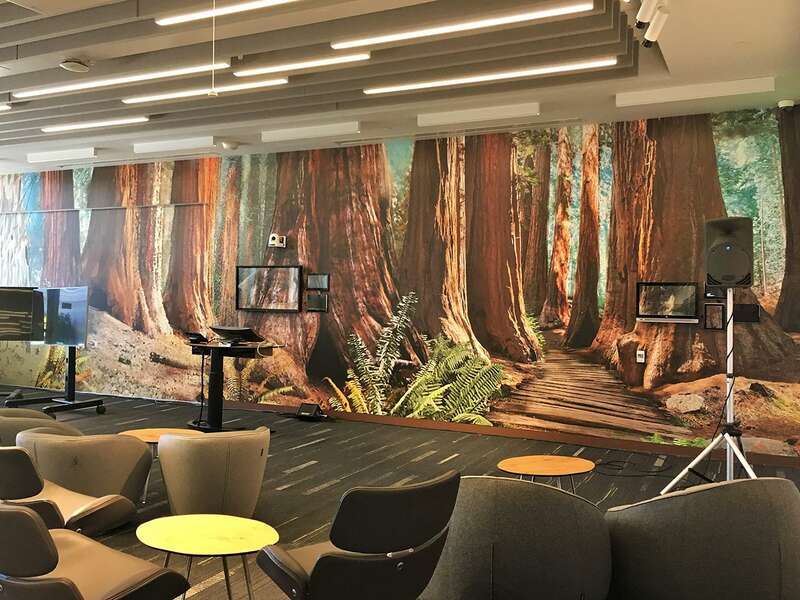 These large-scale graphics can transform spaces to help promote company culture. Companies have used EDG with branding, mission statements, words of wisdom or just eye-pleasing designs or scenery in the form of murals, elevator wraps, window and floor graphics, and more. Influencing Behavior– You can convey a desired feeling in large spaces by using murals and glass graphics. For example, a Volkswagen dealership in Raleigh, NC, wanted to harken back to the automobile brand’s beach culture vibe of the 1960s and 70s. The dealership owner hired SpeedPro Imaging franchisee Mark Simmons to cover the large windows with a beach motif. Not only did it appeal to customers, but it boosted the morale of the dealership’s sales force, which increased sales by 30 percent. You can also influence employee behavior by choosing imagery for walls and windows where one color is dominant over the others. For example, blue is a calming color that also promotes productivity, and green, which also has a calming effect, is an ideal color for employees who work long hours because it does not cause eye strain. Branding – Your company logo and/or messaging displayed prominently on walls or near entryways helps remind employees of where they are and what their purpose is for working there. Your brand’s mission statement can inspire and bolster a sense of pride among employees. 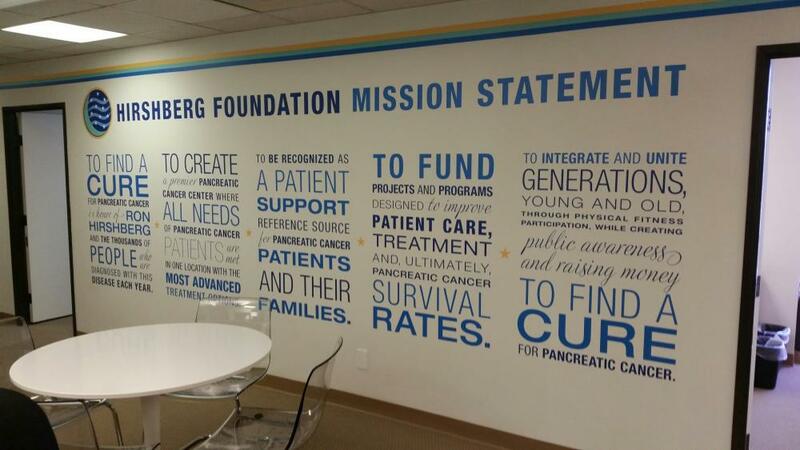 The Hirshberg Foundation did this by covering a wall with its mission statement about finding a cure for pancreatic cancer and being a support and resource for those afflicted with the disease. The culture of your company can also be reflected in your branding, which provides the ideal opportunity to update boring office space with EDG that captures your brand’s style. Other branding EDG ideas include timelines that mark company progress or maps that show the locations of other company sites. Wayfinding – If working in a large building or on a corporate campus, directional signs can alleviate frustration and reduce the possibility of getting lost. By making traversing the work environment simple, you increase the level of enjoyment. Installing creative, colorful wayfinding signs can even make the navigational experience fun. Like loyal customers, employees will feel connected to the company, provided they identify with its values. You can make your company culture even stronger by basing hiring decisions on how well candidates fit in. The atmosphere of the office contributes to the culture that keeps employees returning every day. Company culture provides a sense of purpose, which causes workers to feel like they’re contributing to a common cause. Loyal employees tend to be more productive employees, too. Company culture has the power to attract the right job candidates and keep them. Losing employees is an expensive proposition for companies since turnover can cost thousands of dollars. Developing company culture can save companies money in the long run. Employees who fit in with the culture of the company likely know other people who would also be a good fit. When current employees are happy, thanks in large part to the company culture, they can become company advocates when it’s time to hire new employees. Your local SpeedPro Imaging team can help you enhance your office environment with experiential design graphics to promote company culture. Don’t wait to use custom-designed graphics to boost employee morale, which ultimately leads to greater profits. Find a studio near you.